Rowena The Witch Tee Design Review. The Rowena The Witch tee design is for the Supernatural fans and it pays homage to the classic television showBewitched as a cool mash up. The concept is that both Rowena and Samantha are witches. 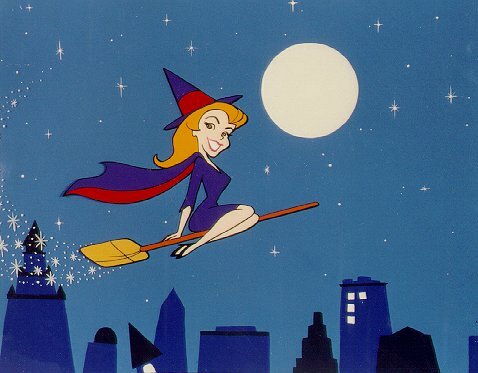 So taking the opening credits from the show Bewitched (shown below) and replacing it with a cartoon of Rowena instead is a no brainer. Rowena of course has that touch of wickedness and attitude that Samantha just didn't have. As for the artwork, it emulates the Bewitched style and it has nailed the colors to work for both shows. 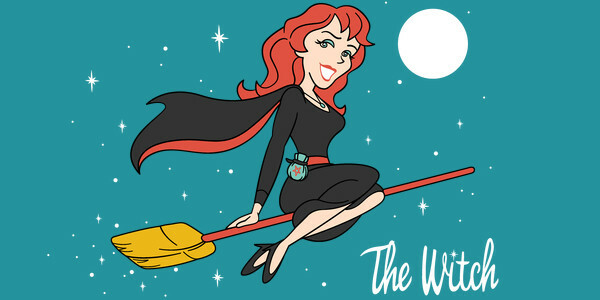 Like the old Bewitched show it has no shading in the cartoon style. The addition of a Hex bag is a nice little detail that reminds people that it is a Supernatural tee. The moons and stars are different sizes. The fonts match but the text is bigger in the Bewitched version which is also centered. It would had been nice to have it match as it would be easier to read from a distance. As previously mentioned, it is a parody/homage so the design layout is obviously right on the money. It looks as good as the original version. This Rowena The Witch tee will make a great gift for Supernatural and Bewitched Fans, especially for those who like the ambitious Redheads. Even with the 2005 movie of Bewitched the people in their 20's or younger may not get the reference. This design is ideal to wear to Comic-Cons and while watching Supernatural (duh). Rowena The Witch Tee Design by Matt Parsons.